Troops of 159 Battalion, 27 Task Force Brigade, Operation Lafiya Dole, vaccinated children of victims of Boko Haram insurgency in the affected villages under their area of responsibility. 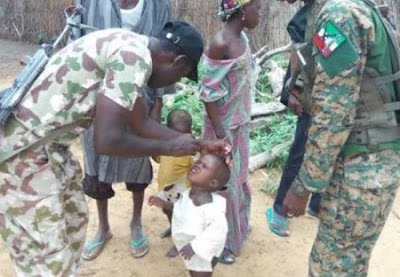 A statement from Brigadier General Sani Usman, Director Army Public Relations, said the immunization took place in over 13 villages within Yunusari LGA, Yobe State, where a total of 1,227 children were immunised in addition to provision of medical aid by the unit’s medical orderly. God bless you people and increase you, may He protect you all in front of battles.